Are you planning a holiday in the South of Spain and looking for the ultimate thrill? We can probably help you! Have you ever tried skydiving? Read on to learn about tandem skydiving in southern Spain. Our friends at Skydive Spain offer the ultimate skydiving experience. Located just outside Seville, their centre is a destination dropzone for thousands of skydivers each year and is regarded as one of the best places in the world to make your first skydive! The beauty of a tandem skydive is that it gives you the thrill of a lifetime without the need for previous training. After a short 15-minute instruction, you’ll be attached to a fully qualified tandem skydiving instructor and ready to enjoy the rush of freefall and the stunning views and gentle descent of the canopy ride! At Skydive Spain you have the added advantage of being able to jump from 15,000 feet, the highest exit altitude in Europe! The obvious benefit of jumping from this altitude is that you get to experience a longer freefall, 1 full minute reaching a speed of 130 mph, as well as an exhilarating 5-minute canopy ride. You’ll arrive at the Skydive Centre on the day of your jump and check in at the main office. Once you’ve filled out all the required paperwork you’ll have a short (15 minute) instruction on the equipment you’ll use, body position during the skydive and the all-important landing! You’ll then jump aboard one of the fastest climbing aeroplanes in the industry. Once you’ve reached jumping altitude – could be 10,000ft or 15,000ft, depending on your choice – it’s time for the big jump! After the freefall, your instructor will open your parachute at around 6000ft and you’ll have approximately 5 minutes under canopy to enjoy the view and ride whilst you speak to your instructor. Upon landing, you’ll be given a skydiving certificate and a USB with your video of the jump if you chose this option (see below). Skydive Spain have fantastic video and photo packages which will allow you to share your experience with family and friends as often as you want. One option is to have your own personal camera flyer who jumps with you and records every aspect of your jump experience, from the training to the actual freefall, canopy ride and landing. This also includes a personalized video of the whole experience. The second option is to book a Handycam which is mounted to your instructor’s wrist and allows for close-up photos and video of the jump. Minimum age of 16 years. Those under 18 need to have parental consent. Anyone aged over 70 years will require a doctor’s signature and stamp on a Skydive Spain medical form. Weight limit with clothes and shoes is 95kg (15 stones) or BMI lower than 27.5. You’ll be weighed before the jump. People with varying levels of disability can participate in a tandem skydive; however, you must provide full details in advance of booking as well as a fitness declaration form to be signed on the day of the jump. All instructors are properly licensed and this includes Third Party Liability Insurance. You must not consume alcohol before your jump. As a special birthday gift. Skydive Spain offer special gift vouchers for these occasions. How about a marriage proposal? This really would be a special way to pop the question! 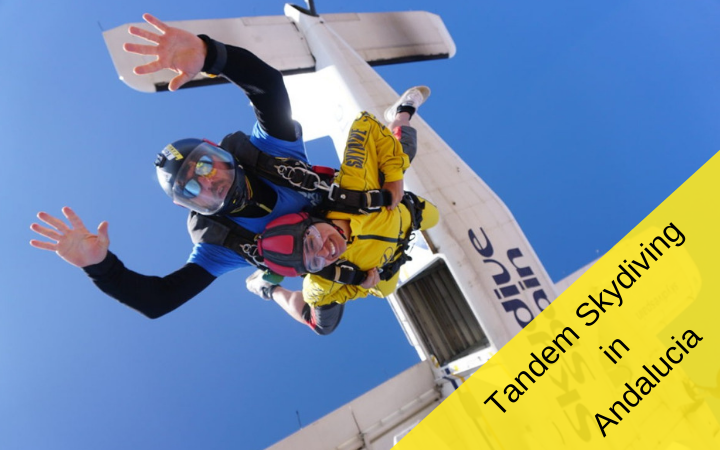 For more information and details about prices for tandem skydiving, please ask at the Sunset Beach Club leisure desk located on the 6th floor of the hotel.